Norwegian Wood (ノルウェイの森, Noruwei no mori) is a 2010 Japanese romantic drama film directed by Tran Anh Hung, based on Haruki Murakami's novel of the same name. The film was released in Japan on 11 December 2010. Toru sleeps with Naoko on her 20th birthday. Shortly afterwards, Naoko withdraws from the world and leaves for a sanitarium in a remote forest setting near Kyoto. Toru is anguished by the situation, as he still has deep feelings for Naoko, but she is unable to reciprocate. He also lives with the influence of death everywhere, while Naoko feels as if some integral part of her has been permanently lost. He continues with his studies, and during the spring semester meets an attractive girl and fellow student Midori, who is everything that Naoko isn't — outgoing, vivacious, and supremely self-confident. The story then follows Toru as he is torn between the two women in his life, and choosing between his past and his future. This film debuted in the 67th Venice International Film Festival where it competed for the Golden Lion. It was then subsequently released in Japanese cinemas on 11 December 2010. In the UK, it was released on 11 March 2011, while in Russia, it was released under the name of Норвежский лес on 16 December 2010. In the US, the film had a limited release on 6 January 2012 in New York City and Washington D.C. In Canada, the film was released on 2 March 2012. The Daily Telegraph said that director Tran Anh Hung was "brave" to attempt to bring Haruki Murakami's 1987 novel to the big screen but mentioned that "the film comes across as a mere summary of Murakami's book". Stephen Holden of The New York Times wrote that the film "registers less as a coherent narrative than as a tortuous reverie steeped in mournful yearning". The score for the film's soundtracks was composed by Radiohead guitarist Jonny Greenwood. An original soundtrack album for the film was released on 10 November 2010, containing pieces from Greenwood's score, along with three songs used in the film by German Krautrock band Can, all originally released between 1969 and 1971. 3. "Mary, Mary, So Contrary"
(from the album Monster Movie by Can) "Mary, Mary, So Contrary"
7. "Bring Me Coffee or Tea"
(from the album Tago Mago by Can) "Bring Me Coffee or Tea"
12. "Don't Turn the Light On, Leave Me Alone"
(from the album Soundtracks by Can) "Don't Turn the Light On, Leave Me Alone"
^ "Norwegian Wood box office gross". Box Office Mojo. Retrieved 19 April 2012. ^ a b "Nippon Cinema (Norwegian Wood Trailer)". © 2006-2010 Nippon Cinema. Retrieved 22 December 2010. ^ "Fuji TV site". Fuji Television Network, Inc. Retrieved 23 March 2011. ^ a b "Venezia 67". labiennale.org. Retrieved 29 July 2010. ^ Adams, Mark (5 March 2011). 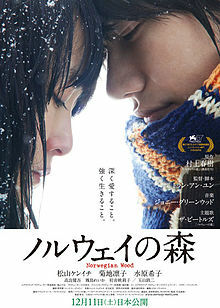 "Beautiful Japanese romantic drama Norwegian Wood". Mirror.co.uk. Mirror.co.uk. Retrieved 22 April 2011. ^ "Film.ru". film.ru (in Russian). Retrieved 22 April 2011. ^ ""Norwegian Wood" Opens in US Theaters; Soundtrack Featuring Jonny Greenwood Score Available on Nonesuch Records". Nonesuch Records. 6 January 2012. Retrieved 23 March 2012. ^ "Film Friday: Project X, Norwegian Wood, Dr. Seuss' the Lorax and more". Nowtoronto.com. 2 March 2012. Retrieved 23 March 2012. ^ Sandhu, Sukhdev (10 March 2011). "Norwegian Wood, review". Telegraph Media Group Limited. Retrieved 23 March 2011. ^ Stephen Holden (5 January 2012). "'Norwegian Wood,' From Haruki Murakami Novel - Review - Young Love as Divine, but a Perilous Insanity". The New York Times. Retrieved 16 December 2016. ^ "Toronto International Film Festival Website". tiff.net. Retrieved 15 January 2011. ^ "Dubai International Film Festival Website". Dubai International Film Festival. Retrieved 15 January 2011. ^ "5th AFA Nominees by Film". asianfilmawards.asia. Archived from the original on 4 December 2011. Retrieved 5 March 2011. ^ "Istanbul 2011". FIPRESCI. Retrieved 5 September 2012. ^ a b "Cdjapan". Neowing. Retrieved 8 March 2011. ^ "Amazon.com, Inc". Amazon.com, Inc. (in Japanese). Retrieved 4 March 2011. This page was last edited on 2 April 2018, at 18:11 (UTC).